At least 150 people have died in the Brazilian state of Rio de Janeiro after the worst torrential rain for decades caused landslides and flooding. BBC News website readers in Rio de Janeiro have been sharing their experiences. On Tuesday, it was chaos in the city. Many people died. It was a sad situation. My children haven't had school for the past two days. My whole family had to stay at home because it was too dangerous to go out. We have had the problem of flooding in the city since 1966 and the situation is worsening each year. I hope that this tragedy can be the beginning of a solution. Now, the sun is appearing and we can see some piece of blue sky. The city is beginning to come alive again. The sun has come out after nearly 48 hours of intense rain but more rain has been forecast for the next two to three days. The whole of Rio came to a standstill on Tuesday and scores died in Niteroi and the Plazeres in the Santa Teresa neighbourhood. Once again, the poorest are the worst hit by this tragedy. I've never seen such chaos. We weren't prepared for this, even though we were warned that a big storm was about to come. The news is saying that one of the biggest reasons for the catastrophe is the garbage in the streets. We need to educate our people, otherwise we won't be able to change. Of course it's a huge storm, the worst in 44 years. Schools and stores are closed and we've been told not to leave our homes. But the situation would be very different if we took care of our beautiful city. I hope now that the government will do something to change this. It's incredible what's going on here, I've never seen it before. The situation is chaotic, the city has collapsed, but it's also important to remember that every big city in the world would face the same issues with such an enormous amount of water. Rio's problem is that it was not supposed to be a city of 12 million people. It should be a natural park, because of the number of mountains, rivers, lakes and ponds that surround it. Besides, many parts of the town are below sea level. It is also important to mention that the majority of the shanty towns are located in the hills without proper planning and therefore landslides are common in those areas. Today I witnessed Rio de Janeiro on the brink of collapse. I ventured out around midday, just as the electric power blacked out in my neighbourhood. What I encountered was unbelievable. Huge trees had come down in the storm blocking roads. Major traffic arteries were closed to traffic due to flooding and fallen trees. The streets looked more like dirt tracks; they were thick with mud. The city reminded me of a war zone. Rio has a terrible littering problem and one of the contributing factors to the flooding are the blocked drains. The mayor has alerted locals to the importance of throwing litter in the numerous plastic orange bins that dot the city but to no avail. I have been living in Rio de Janeiro for over 16 years and I have never seen anything like today. A lot of progress will need to be made in the next few years if Rio is to successfully host the Olympics in 2016. There has been relentless rain for over 24 hours. Last night some people from my husband's office didn't even make it home all night, as the roads were flooded. The Niteroi bridge was closed and there was terrible traffic. On Tuesday morning the flooding was worse and my husband's office didn't open and our children's schools were closed too. Yesterday, I left work at 2200. It had been raining since 1700 and I knew it would be difficult to go back home. However, I had no idea that I would be trapped in such a monstrous traffic jam, the worst I have seen in my life. When I finally parked my car at my garage it was 0830. 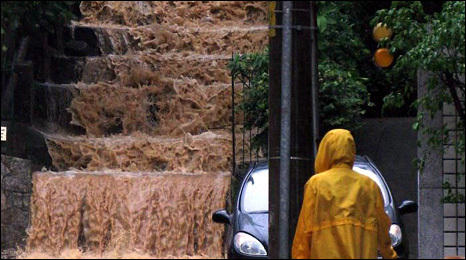 Heavy rain in Rio is common in March and April but this tempest was as devastating as a biblical punishment. 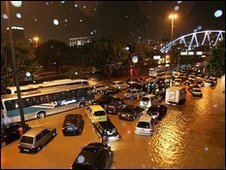 Rio de Janeiro is a city prone to flooding, both geographically and meteorologically. In addition we have decades of irregular occupation of mountains, which were once full of vegetation and a badly educated population that insists on littering the city. The result is complete chaos. It seems like the city is actually collapsing. The streets are filled with mud and garbage, and practically empty. Yesterday it took me five hours to get home, instead of the usual 50 minutes. There are so many new buildings cropping up in the city every single day without any kind of forethought or proper planning. I don't just mean in shantytowns but also buildings for the middle classes. The city is growing without control.